April 2019 marks the 25th anniversary of Nelson Mandela's election as President of South Africa. His path to the Presidency, however, was long and marked by the violence and brutality of the white-only National Party government and the armed opposition of the African National Congress (ANC). In 1962, he was charged with four counts of sabotage and conspiracy to violently overthrow the government, for which he received a life sentence. He served 27 years in prison, the initial years in conditions that eventually gave Mandela tuberculosis. During his imprisonment, he was often forced into solitary confinement, yet he managed to earn an LLB degree from the University of London and corresponded with world leaders. He was given an unconditional release in 1990. He spent the next four years negotiating the end of Apartheid with the government of F. W. de Klerk, for which Mandela and de Klerk were jointly awarded the Nobel Peace Prize. He was elected President of South Africa in the first multiracial general election on April 27, 1994. 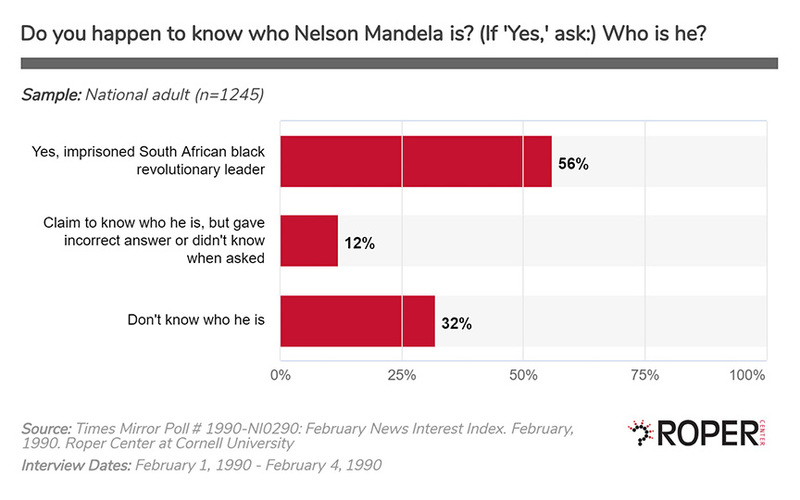 The first questions in the iPoll database about Nelson Mandela date from February 1990. They ask about respondents’ knowledge of his situation and opinions about him following Mandela’s recent release from jail in South Africa. Fifty-six percent of those in a Times-Mirror poll knew who he was, and 42% were following his story very or fairly closely. Ninety-one percent knew he had been released, and 70% said economic sanctions imposed on South Africa were a very or somewhat important factor in the government deciding to release him. 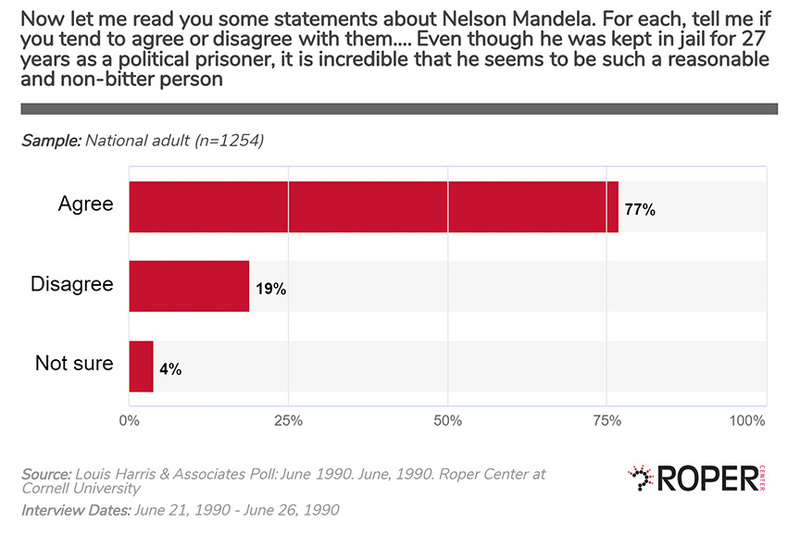 In June following Mandela’s visit to the US, 64% in a Harris poll had a positive opinion of him versus 27% who viewed him negatively. He was obviously making a good impression on many Americans; 77% agreed that “even though he was kept in jail for 27 years as a political prisoner, it is incredible that he seems to be such a reasonable and non-bitter person”, and 60% said that “he has a personality and character which stamps him as one of the truly outstanding leaders of the world”. More than half had some concerns about his tactics; 54% agreed that “when he advocates that the US and other western nations keep the sanctions on South Africa as a way of getting that country to give up apartheid, he risks having the De Klerk government that gave him his freedom thrown out of office by more conservative whites.” Fifty percent said that “the fact that he has a history of having cooperated with radical, revolutionary elements in the past makes you wonder how fit he would be to take over any leadership role in South Africa”. An NBC/WSJ poll in July found 54% with a very or somewhat positive view of Mandela, but opinion on continuing the sanctions on South Africa was mixed. Forty-eight percent said the US should continue sanctions, 15% said decrease, 16% said remove them entirely, and 5% volunteered that they should be increased. 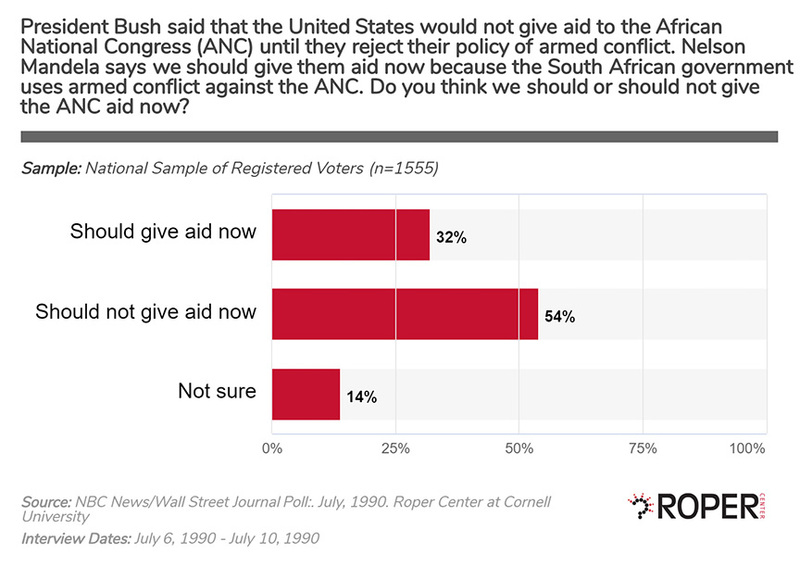 Only 32% supported Mandela’s contention that his group the African National Congress should get US support due to the South African government’s attacks on them, but 54% agreed with President Bush that the ANC had to renounce armed action before receiving US aid. 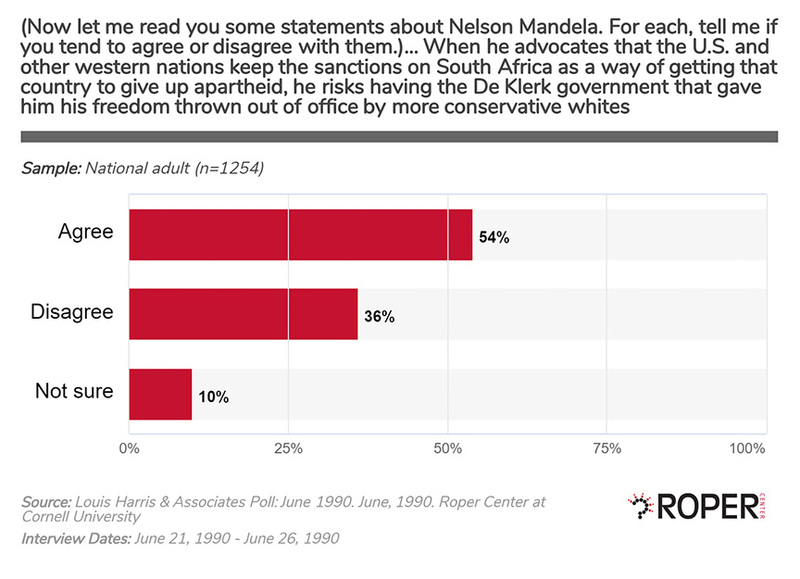 By April 1994 as he was preparing to become South Africa’s first democratically-elected president, 61% of respondents in a Scripps Howard/Ohio University poll called him a hero, and 53% in an NBC/WSJ survey had a very/somewhat positive opinion of him versus only 16% who said very/somewhat negative. In 1999 after his term came to an end, 17% said he was one of the people they most admired in the 20th century, while 26% said they admired him but not among the most admired and 27% somewhat did so—only 18% said they did not admire him. The last issue-related questions about Mandela are from 1999, where 55% associated him with the global fight against AIDS in a Kaiser survey and 50% said he stood out as a leader in that fight. 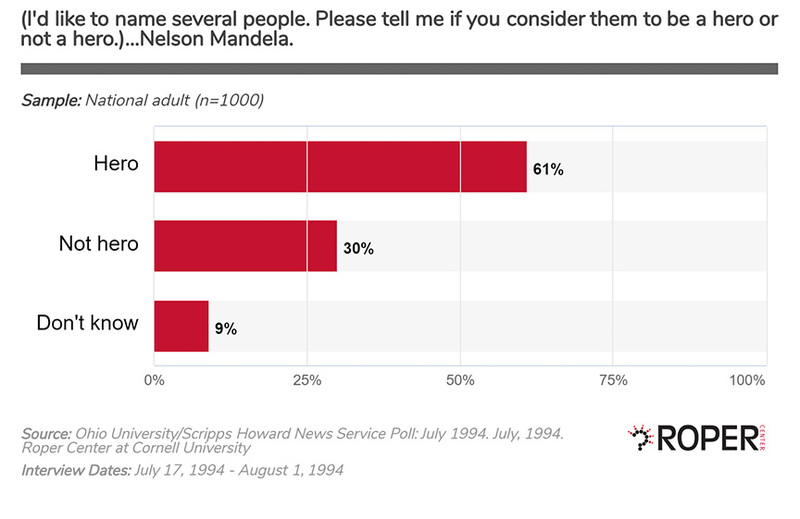 Find more questions about Nelson Mandela in the iPOLL database here.